Reflective Generator Warning Decal - As Required By NFPA Part 70� The National Electrical Code.� Approved by Electrical & Building Inspectors.� Protect the lives of Service Personnel & Emergency Responders. Sold in a 2-pack (2 decals for each generator installation) decals are�packaged in pairs for your convenience.� Same Day Shipping! As required by NFPA Part 70 The National Electric Code. Protect the lives of Service Personnel and alert Emergency Responders that a Backup Generator is installed. 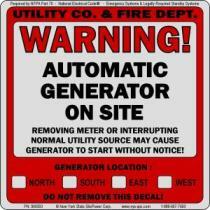 Includes (2) 3M Reflective Warning Decals for the identification that a generator is installed on site. Approved by the NYS Dept. of State Building Inspectors and others. 4"x4" size conveniently fits most meter enclosures. Approved by many Electrical Inspection Agencies across New York and other states. Independently tested 3M "Engineer Grade" reflective material for durability & longevity. Decal can be punched out or marked with permanent marker to indicate location of generator. UV coated for long - lasting, superior outdoor durability. Sold in packs of (2) as recommended by Electrical & Building Inspectors, each pack contains two warning decals for each generator installation; Where to use: Place one decal on your electrical service panel, and one on the electrical meter enclosure outside. (Not on the meter itself!). By placing the second decal outside on the meter enclosure, you help Firefighters & the Utility Company identify an installation without even entering the structure to find the service equipment. New York Residents - these decals may also be available through your Town or City Building Department when a permit is issued for a generator installation; check with your local Building Officials. Electrical Contractors & Generator Dealers - These decals may be available at your local supply house. If not, have them contact us to get them in stock. Contact us for volume discounts. (Required Sales Tax is automatically added for NYS residents. Municipalities, Public Safety Agencies and Non-Profits may order by telephone at 1-888-697-7693 or contact us with your PO# to avoid sales tax. Orders for resale may be placed by the same method; A NYS resale certificate with valid Tax ID Number is required.) Same Day Shipping!